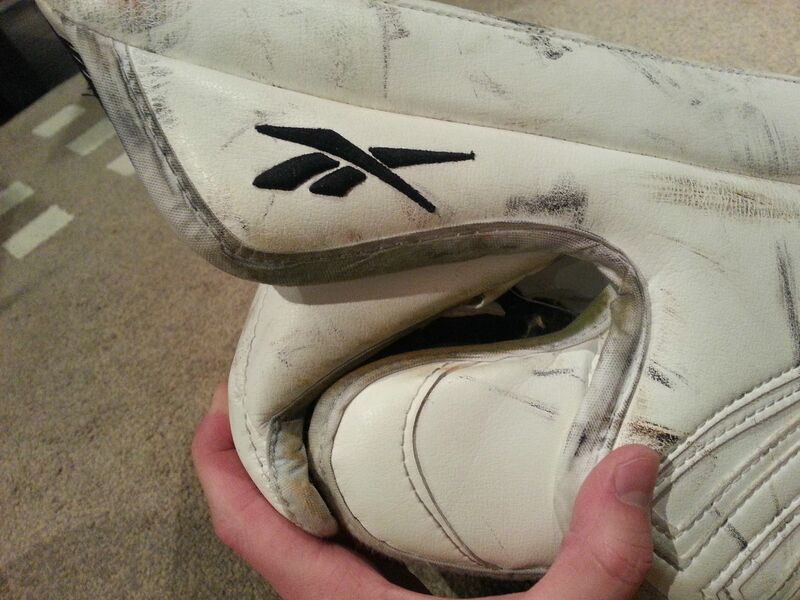 I believe these were Reebok’s first full line of pro equipment made entirely overseas. To some people this is an issue, to me as long as the equipment works I am happy. I am going to review these as 2 separate items as my opinions on them are pretty different. 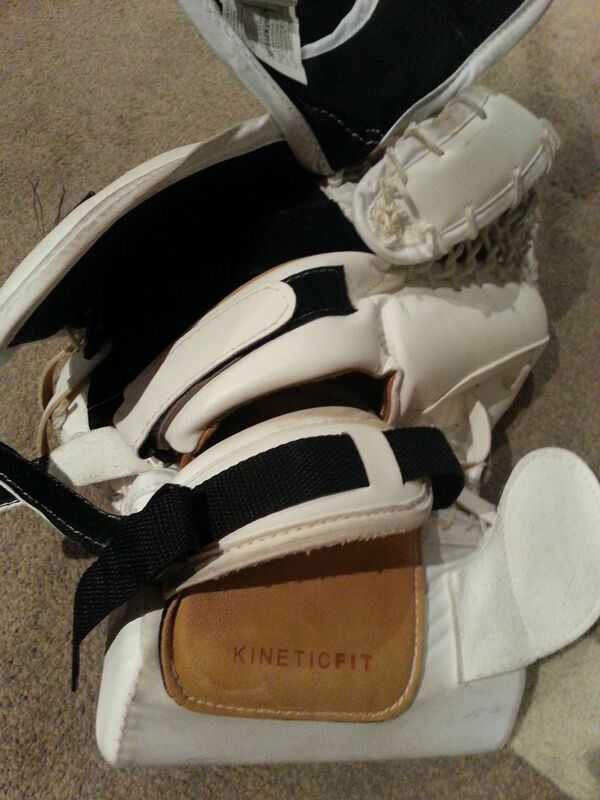 Initial Thoughts: When I first received the blocker I felt like it was bulky and almost cumbersome since I was coming from a flat board Simmons 994 blocker and a very lightweight Warrior Messiah blocker and Smith blocker. 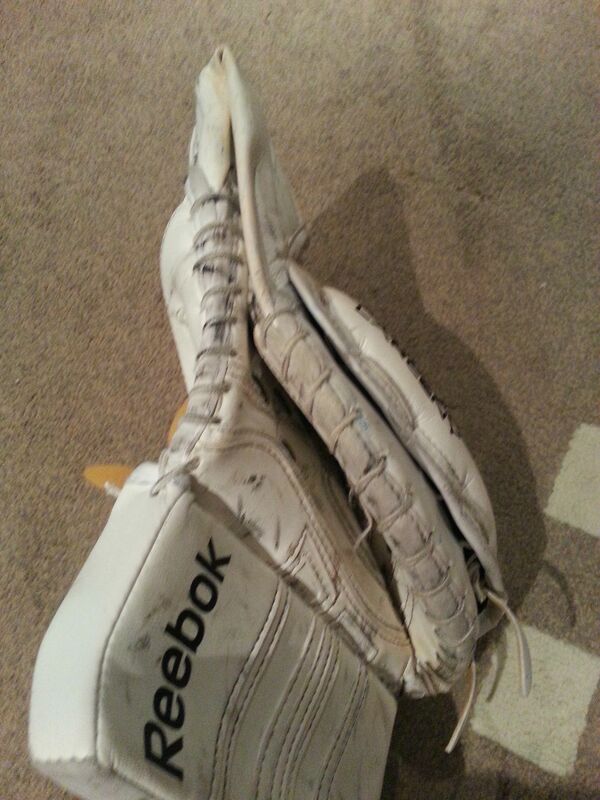 I also noticed how protective this glove is compared to my previous blockers. 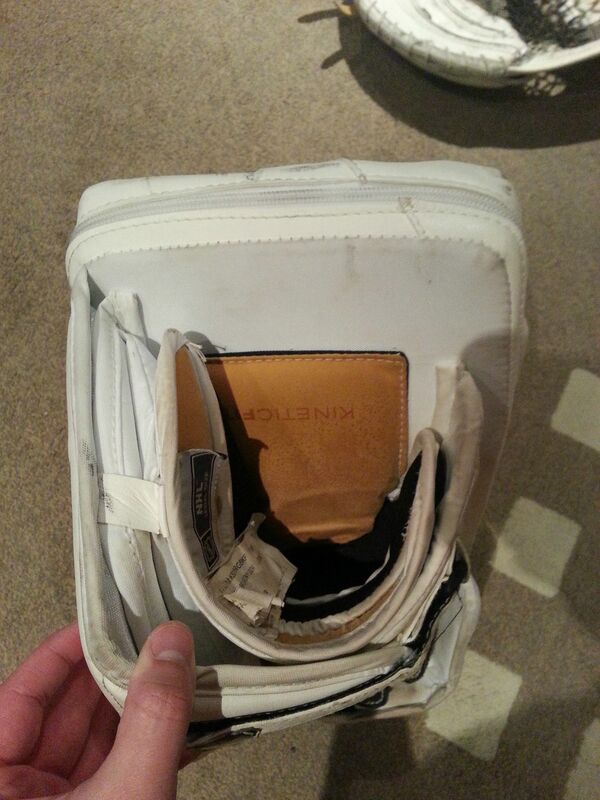 The Larceny blocker is very well made and was extremely comfortable to put my hand into. Comfort: This blocker feels pretty big on your hands, it has a huge side board but it is lined with pillows everywhere for protection and comfort. Putting my hand in this was an absolute treat. The palm material is this extremely soft leather that was honestly the most comfortable palm material I have ever tried, and there is a big pillow of it that sits on the top of your hand adding cushioning for the blocker. Unfortunately since using the blocker for over a year now the palm is crusty and sometimes almost annoying to put on. Now sometimes I have to pour water in the glove to make it soft again. 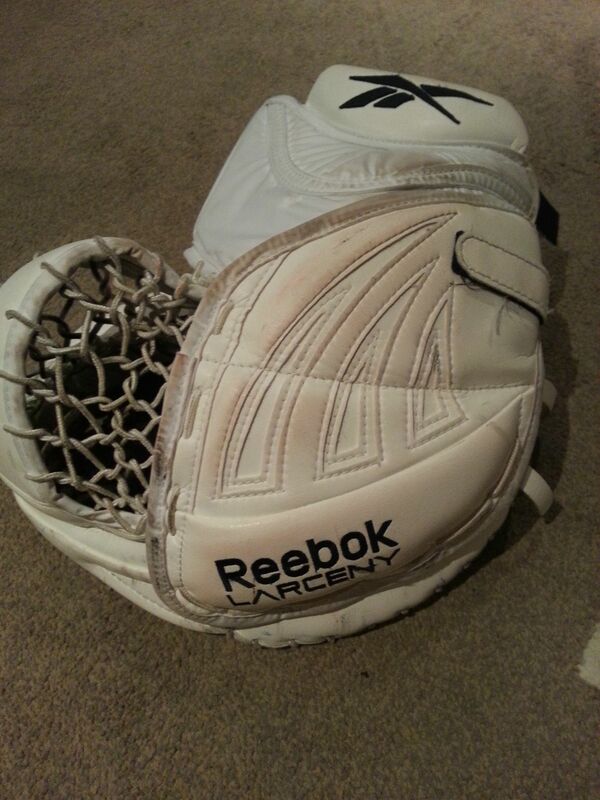 I air my equipment out after every game and never let it sit out in the damp or in my bag, I have also never had this issue with any other pair of gloves I have owned. I understand palms wear down but this is the most drastic change I have ever experienced for a comfort level. Initial Thoughts: The catching glove covered considerably more surface area than my previous Warrior Messiah glove did, and about the same as the Smith (although the Smith wasn’t deemed NHL legal for sizing). It has a very baseball mitt like closure and I felt like I would become a more catching style goaltender instead of just a blocking style. Protection: I figured this glove would be just like the blocker in terms of protection, and for the first half of a year I was right. Before I get to the palm I should say the back hand of this glove has a great slash protection for the fingers and is extremely protective against random pucks and slashes. Now to the palm. When I originally got this glove I rarely felt a shot and if I did it was simply because I took a puck right to the palm. Even then the shot never stung or hurt, but I knew exactly where I got hit. A year later and I am honestly afraid to use this with certain shooters. I noticed I have started to feel shots from guys that I have never felt before. Recently I took a shot to the palm by a local university player and my hand went numb for about 5 minutes. I then decided to go and get an upgrade because of this. New: 8/10, Now 5/10. I am giving this a 5 and not lower because some people see this as a sacrifice in order to be able to squeeze the glove easily and catch pucks better. Conclusion: I absolutely loved this glove when I got it. 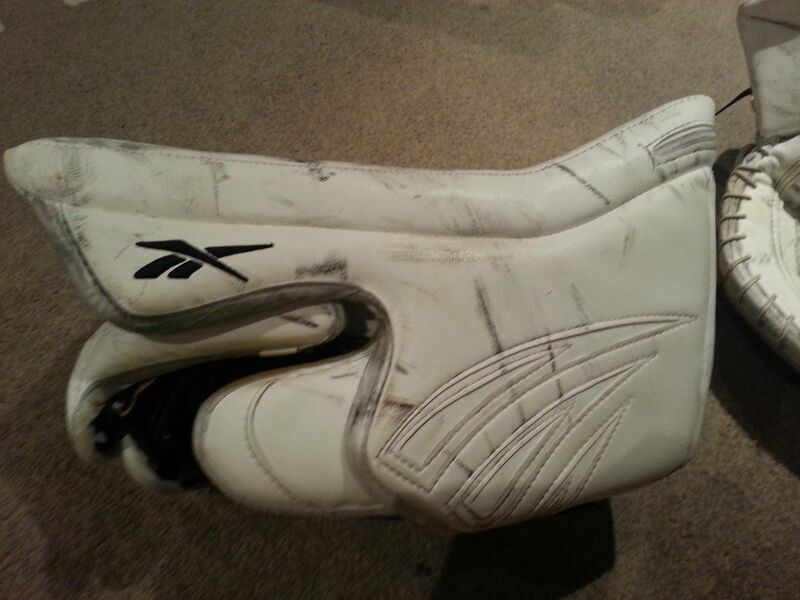 In a years time I went from a goalie who just blocked shots that were near my glove, to a goalie that caught everything on that side of my body, and back to something in between those 2 extremes. Unfortunately the protection has degraded vastly and I honestly don’t feel safe wearing it anymore with the stronger shooters. 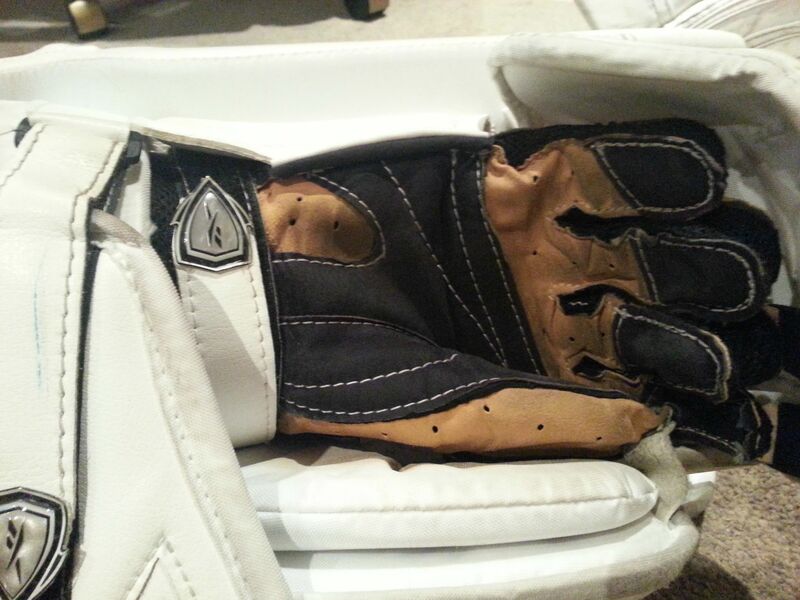 Which is a shame because all goalies know they want to wear matching gloves! But seriously I wanted this glove to last me a very long time as I was more comfortable with this glove than many that I had before it, but the lack of protection has made me put it on the sidelines. Small rip along the nylon where the stick is held. 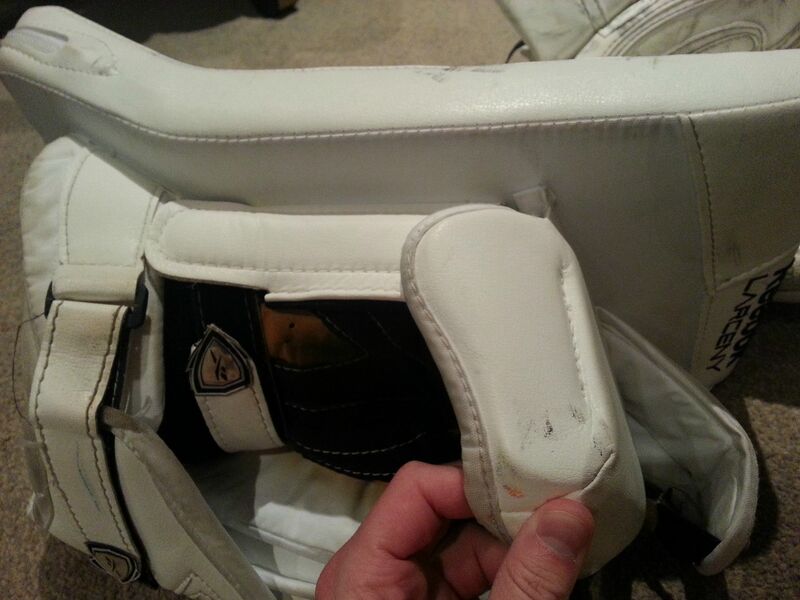 The finger protection is really good and I have never had a puck slide up my stick and hurt here. Outer hand protection is great as well and I’ve never had issues with this glove when I have with previous ones. 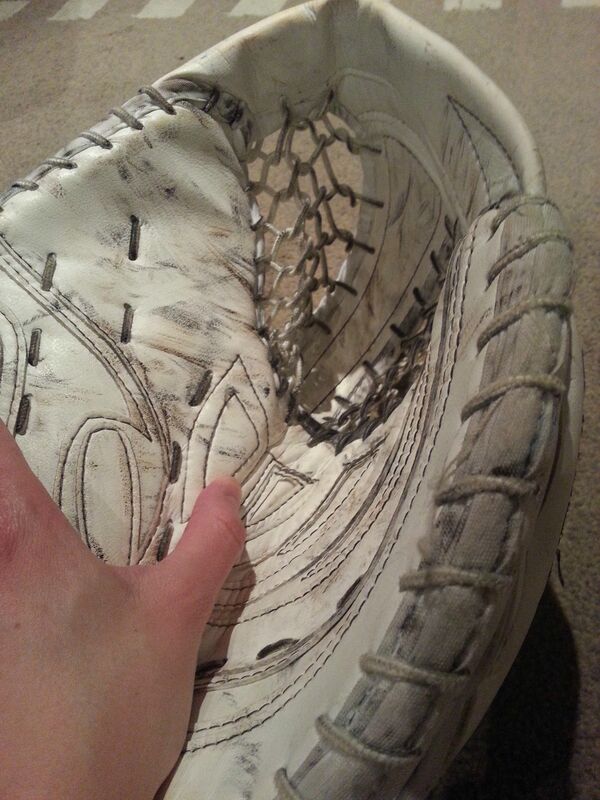 Palm was once super soft and comfortable and now crusty and hard. Besides that there is absolutely no wear showing on the palm. Large sideboard cushions deaden shots to the sideboard and a big soft leather pillow deadens shots taken head on. Great closure out of the box. 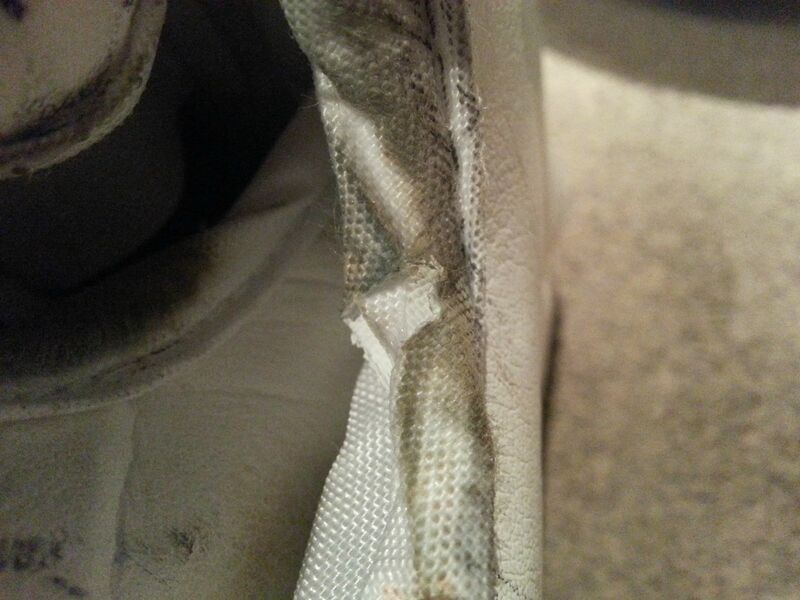 The bump of the material on the palm of the glove, this started appearing after about a month of use. 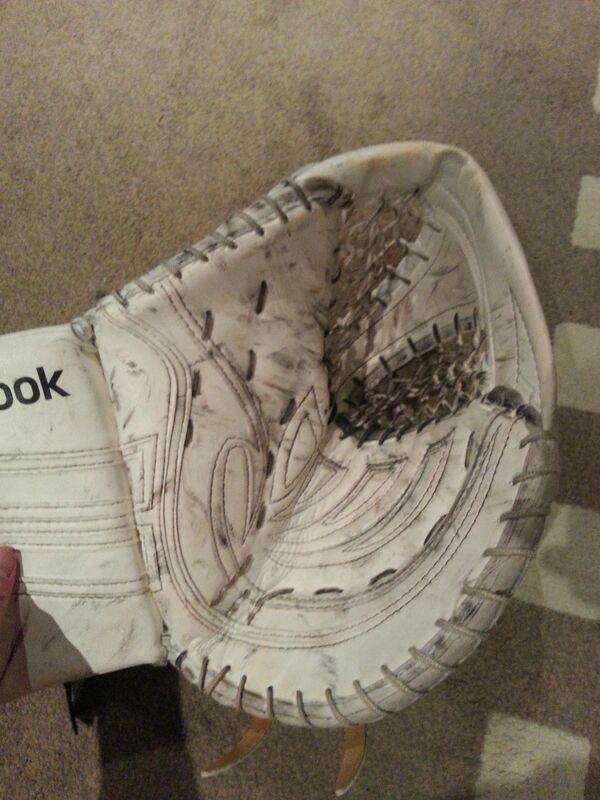 What the glove looks like with the bump. What the glove originally looked like, the palm angles towards the pocket more when the bump wasn’t there, now with the bump the palm is flatter to the shooter and I find pucks bounce off it more than they used to. 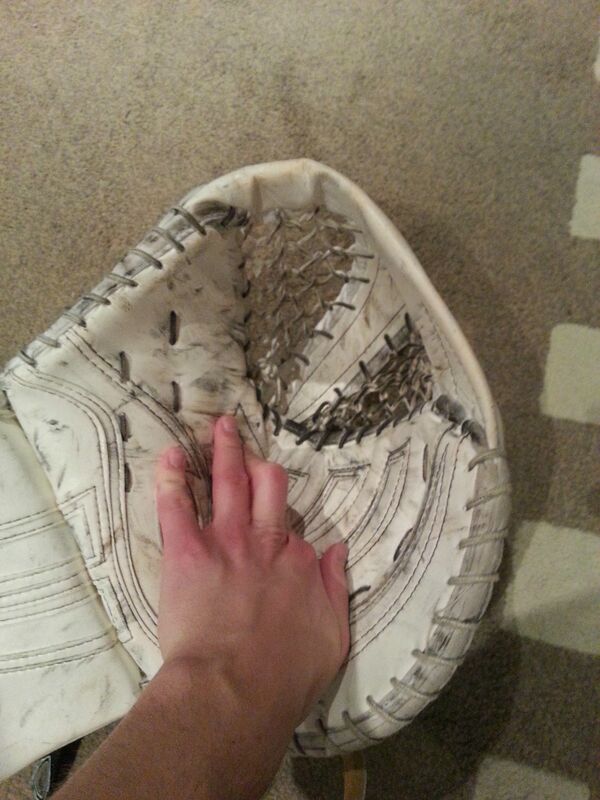 Good backhand protection, soft finger slash guard. Glove opens up quite a bit in the back.